This study assesses the extent to which India and China have tapped their trade prospects in selected African countries over the 2000-07 period using gravity model analysis. The results indicate that India has exhausted its potential in merchandise trade while China is yet to do so. Unlike India, China�s performance is influenced by its FDI in Africa. However, in the case of India, opportunities exist in the services sector. This study further delineates the potential areas for trade in services in Africa that India can focus upon, given its growing capabilities in services exports. Africa is highly attractive to developing countries like India and China on account of being rich in natural resources and for being a developing market for many commodities and services. These countries can use cheap African raw material and resources for manufacturing at competitive prices and sell the products globally. In return Africa can also gain a lot from these partnerships in terms of inexpensive manufactured goods and investments in sectors like mining, forestry, infrastructure, agriculture, healthcare and education. Both nations have identified this potential and are competing against each other to gain greater access to the African markets. This study employs gravity modeling to analyze the current trade levels between African nations and India and China respectively and then rationalizes the trade levels by comparing them to the model predictions. Five major African countries were selected for this study, namely, South Africa (growing African economy), Nigeria (mineral resource rich country), Kenya (growing economy with close ties with India), Zambia (economy with close ties with China) and Uganda (underdeveloped economy). the analogy used for trade is just the same with the GDPs of the two economies replacing the masses of the body. However, there is generally no pre-determined constant like the universal gravitational constant. This constant varies for each pair of economies and it has to be estimated through a regression analysis which fits historical trade data to the historical GDPs of the economies in question and the geographic distance between them. The simplicity of the model may be baffling. However, with the addition of a number of more factors which might have an influence on the actual trade volumes, it has proved to be quite potent in explaining the volume of trade between a pair of economies. Historically, the most classic and early application of the model to international trade was by Linnemann (1966) . It has been refined over time by the likes of Helpman and Krugman (1985), Bergstrand (1985) and Alan Deardorff (1995) and it has been used in recent times for estimation of trade potential as well as analysis of trends in commodity trade. The modified model that was used is as follows. As is evident, we have used an augmented form of the basic gravity model equation stated above, where we have considered factors like population, political stability (measured through governance indicators ) and global competitive index in addition to distance and GDPs. Certain other factors like common government type, common border between the countries, whether the country is a landlocked one or an island and whether the countries have shared a common trade route some time in history also have definite bearings on their trade relations. These factors have also been incorporated and are represented through dummy variables. 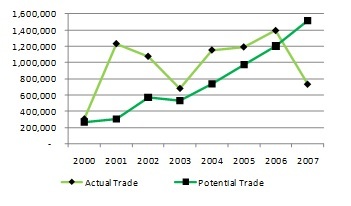 The required data was obtained from United Nations Commodity trade data base , CIA world fact book and a number of other national and international sources and the gravity model was established for India and China with respect to more than 120 other countries, by computing the model parameters through regression. Uganda: Uganda, a war torn country in the Sub-Saharan region, is rich in natural resources but its restrictive trade policies, dependence on neighbouring countries� transport infrastructure (as it is a landlocked nation) and political unrest negatively impacts its trade potential. India has saturated its trade potential with Uganda whereas China still has potential. Zambia: Poverty continues to be the significant problem in Zambia. However, its economy has strengthened and features single-digit inflation, a relatively stable currency, decreasing interest rates, and increasing levels of trade. Zambia is relatively more open than most of the countries in its neighbourhood. This is because of the fact that it had initiated a comprehensive reform program in 1991. 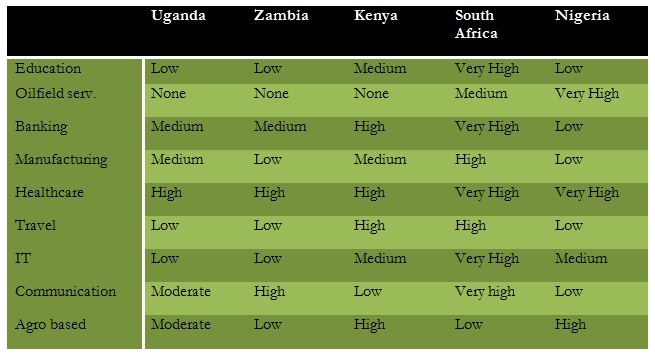 The gravity model analysis suggests that both India and China are trading above their potential with Zambia. Kenya: Kenya is one of the easier countries to trade with compared to the rest of Sub-Saharan Africa. It has followed a progressive liberalized trade policy since 1980. Kenya has been placated time and again by the IMF in the form of withdrawal of loans and by extending financial support. These were due to corruption at high places and this negatively impacts Kenya�s trade potential. The gravity model analysis suggests that India is trading above its potential whereas China has realized its potential. South Africa: South Africa is one of the most attractive emerging markets after the BRIC nations. 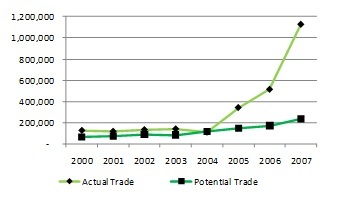 The abundance of natural resources, presence of the 17th largest stock market in the world, well developed financial and legal systems, and presence of modern infrastructure in terms of communication systems, roads and railways which ensures efficient distribution of goods to major urban centres throughout the region, has resulted in robust growth from 2004 to 2008. Gravity model analysis shows that India has saturated its potential while China still has unrealized potential in trade with South Africa, as reflected in Exhibits 3 and 4, respectively. Nigeria: The country has seen a high level of political uncertainty recently with a 16 year long military regime ending in 1999. Nigeria has had over-reliance on oil and the former military rule could not diversify into other econ omic sectors. Oil still provides 95% of its foreign exchange earnings and 80% of its budgetary revenues. Its growth is limited by poor infrastructure. Gravity model analysis shows that both India and China have saturated their potential in commodities trade. 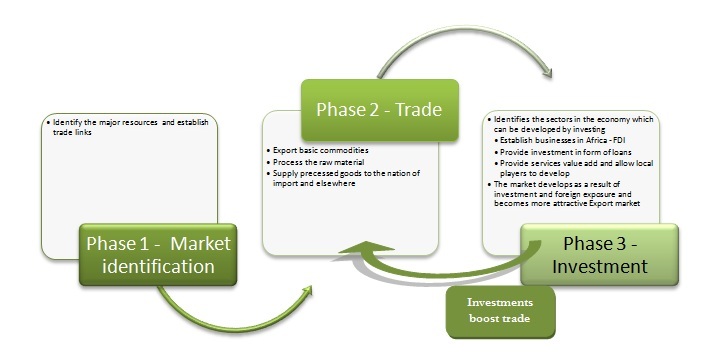 For almost all the selected countries, trade with India is stuck in the primary phase. A deeper analysis of the current trade mix, coupled with a study of existing trade relations provides ideas for boosting trade prospects with India. Uganda exports basic commodities like coffee, glass fibre, etc. to India and in turn procures manufactured items from India. Agricultural products have high potential after manufactured goods. The largest import of Zambia from India is pharmaceuticals. This creates an opportunity for the Indian pharmaceutical industry to foray into the generic drugs market in Zambia. India imports more than 80% of Zambia�s iron ore in the form of ingots and exports steel structures. These are value-added products derived from the same steel that Zambia exports to India. There is thus scope for providing value added products in manufacturing as well as manufacturing-related services. With Kenya, the potential for trade in food and agricultural products remains untapped. There are also prospects for the Indian generics industry to enter Africa through Kenya. In the case of South Africa, 90% of the latter�s imports of chassis fitted with motor engines is from India. Hence, the automotive industry and engineering services related to automotive manufacturing have good prospects. Nigeria is a much more technologically advanced trading partner for India as compared to most of the other African nations under study. Crude oil forms more than 95% of Nigeria�s exports and India accounts for 11 percent of these exports. Energy trade and related engineering services are thus promising areas for boosting commercial relations between India and Nigeria. There has been upward pressure on wages and production costs in China and India in recent years. Hence, both countries are looking at Africa as a major source of cheap raw material and natural resources. Africa is also being seen as an untapped consumer market for cheap manufactured items. Both countries are also seeking to realize their investment potential in Africa. 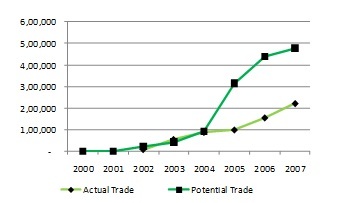 The following model (Exhibit 5) best explains the trade investment link between China and India with African nations. Factors like rich natural resources in Africa have always attracted FDI in oil and primary commodities sectors, regardless of the lack of good investment conditions. Improved macroeconomic and political stability for countries like Nigeria and Egypt, sector-based reforms in financial sector in Nigeria and in automotive sectors in South Africa, simplification of FDI regulations, the establishment of more transparent FDI regimes in a number of countries like Ghana, Senegal and Tanzania and the increase in international agreements between African countries and the rest of the world are some more reasons for the increase in India�s FDI in Africa. India�s stronghold in service sectors like information technology, telecommunications, financial systems, healthcare, education and in commodities like inexpensive medicines as well as low-cost manufactured goods make it an attractive trade partner for African nations as they try to modernize their economies. In Nigeria, ONGC has invested close to US$6-billion to build a power plant and railroads in return for stakes in oil fields. India is also developing an e-connectivity project to link Indian education and health institutes to remote learning and medical centres in Africa. Failed Bharti-MTN deal was another attempt to strengthen south-south relations. China on the other hand has its strategic interests in mineral, metal and oils resources. Acquisition of market access, resources, and strategic assets (for example, oil-fields, access to African market and distribution channels) guide Chinese investment philosophy. China�s relationship with Africa is more extractive while India�s could be seen as more integrated with local development and thus more likely to foster good will. With limited possibilities for growth in commodities trade, services seem an attractive area where India can strengthen its trade relations with African nations. Sectors like education, oilfield services, banking and financial services, travel and recreation, healthcare, IT and communication technology and agro and food processing are attractive for India-Africa services trade. Markets like South Africa and Kenya are ripe for high end services in IT and communication, education, healthcare and banking driven by high technological readiness, high levels of higher education, high levels of financial markets sophistication, high government spend on education and poor healthcare infrastructures. Nigeria is a suitable partner for oilfield services trade because of its high dependence on petroleum. Exhibit 6 below summarizes attractiveness of different services in the five nations based on relevant factors. As predicted by the gravity model, we see that India has virtually exhausted its trade potential with African nations in terms of commodity trade. However, the same is not true for China. There is a lot more potential for China to engage in commodity trade with Africa. However, India can look at trade in services to bolster its commercial relations with Africa, given its growing competitiveness in services trade. India can also explore investment opportunities and the development of markets in Africa in order to boost its prospects in merchandise trade. Rupa Chanda is a Professor in the Economics & Social Sciences Area at IIM Bangalore. She can be reached at rupa@iimb.ernet.in. Saikat Banerjee (PGP 2008-10) holds a B.E in Mechanical Engineering from Birla Institute of Technology & Science, Pilani. He can be reached at saikat.banerjee08@iimb.ernet.in. Aayush Vishnoi (PGP 2008-10) holds a B.Tech in Mechanical Engineering from Indian Institute of Technology, Kanpur. He can be reached at aayush.vishnoi08@iimb.ernet.in. 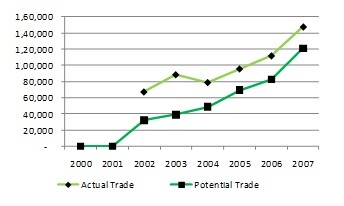 Batra, Amita, 2004 �India�s global trade potential: the gravity model approach�, Working paper no. 151, Indian Council for Research on International Economic Relations. Deardorff, Alan.V, 1995, �Determinants of Bilateral Trade: Does Gravity Work in a Neoclassical World", NBER Working Paper 5377, National Bureau of Economic Research, United States of America.